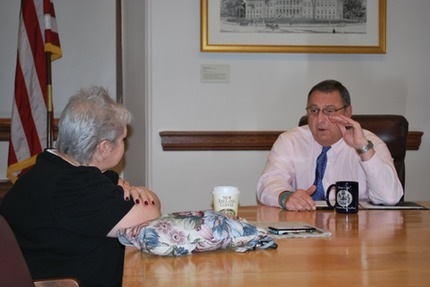 January 6, 2012 -- One year and one day after he was inaugurated, I sat down with Governor Paul LePage for the first time since he was inaugurated to discuss what he's done in the first year of his administration. We talked about welfare, (private non-medical institutions (PNMIs), Great Northern Paper, the domestic violence and what the Governor calls "the 3 G's: energy, education, and the economy." "At the end of the day, this is a problem that needs to be addressed, and it will be addressed. Because we're not putting people out on the streets, and they can do all the political rhetoric they want, but at the end of the day, we're going to keep people in the homes, and we're going to provide medical assistance to the most vulnerable, and they're just going to have to deal with it." "…in the state of Maine, 100 megawatts of hydro power is considered renewable clean energy; 200 megawatts of electricity is not considered renewable and clean energy. And the reason that's that way is special interest groups have passed a law that says we don't want cheap energy from Canada; we want wind power, solar power that is generated and made here. Well, that's fine and dandy, but it's subsidized by guess who? People who pay electricity." "Basically, on a world scale, the United States of America has dropped in their quality of education in K through 12 from first in the world to around 27th. So we need to look at how we're doing it. And so we're focusing on getting more effective teachers in the classroom..."
"…we're going to try to connect Aroostook County to the rest of the grid in the state of Maine so that we'll be able to…transport electricity all the way to southern New England through Bangor-Hydro and Central Maine Power." Governor LePage's official web presence, "Office of Governor Paul LePage," is here.